A Greensboro, N.C., native, Morgan grew up swimming competitively. He swam at the collegiate level at the University of North Carolina at Greensboro. He became an instructor in 2004 and is a Level 2 USA Swimming and an American Swimming Coaches Association certified coach. 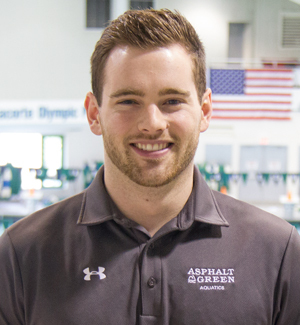 Prior to joining Asphalt Green in 2014, Morgan ran a learn-to-swim program and served as head age group coach for STAR Aquatics in North Carolina. There, he coached multiple swimmers to qualify for Junior Olympic, state, and national-level meets. One of his biggest accomplishments is teaching one child how to swim and coaching her to the Junior Olympics. Morgan’s coaching philosophy is smart swimming is fast swimming. Mastering stroke fundamentals is the only way to successfully progress. His goals are to help swimming develop a love for the sport, improve better stroke technique, and learn the importance of accountability. Contact Morgan at 212.369.8890 x2313 or mmabe@asphaltgreen.org.